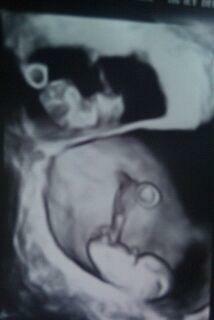 I am now 24 weeks but this sonogram was done the day we found out we were having twins (9.5 weeks). It is SO amazing! This is the only one I have that shows both of them in the womb in one pic. If you have any questions you can email me at summerf27@yahoo.com I would love to speak to other twin mothers, expecting or already born. This is my first pregnancy and probably my last so I am loving and enjoying every minute! !